FAYETTEVILLE, Ark. 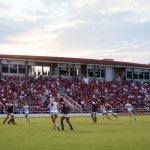 — For the fifth time in six years, the Arkansas soccer team is among the 64 teams that were selected Monday afternoon to compete in the 2018 NCAA Division I Women’s Soccer Tournament. 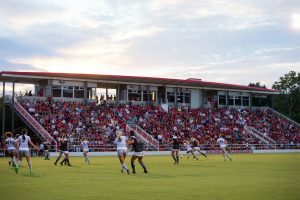 Arkansas earned a host bid and will play its first-round matchup against Sun Belt-champion Little Rock at Razorback Field. Game time is slated for Friday at 7 p.m. and will be streamed on SEC Network+ via the Watch ESPN app and WatchESPN.com. Tickets are now available through the Razorback Ticket Office. Adult tickets are $8, while kids 17 and under are $3. All University of Arkansas students with their student ID will be admitted free to the match. All patrons in attendance must have a ticket regardless of age for NCAA events. Tickets can be purchased in advance online, by contacting the Razorback Ticket Center at 479-575-5151, or at the north entrance of Razorback Field beginning at 5:30 p.m. on game day. This is the second time in school history that Arkansas has been selected as a host site for the first round of the NCAA Tournament. Razorback Field last played host in 2016 when Arkansas took on Memphis and won a 2-1 thriller in overtime. Arkansas (13-4-4) is coming off its third-straight SEC Tournament final appearance and fifth in school history as it padded its postseason resume with neutral site wins over Ole Miss and Florida last week. Arkansas is one of nine teams from the SEC that made this year’s NCAA field, joining Ole Miss, Texas A&M, Tennessee, South Carolina, LSU, Auburn, Vanderbilt and Mississippi State. This will be Arkansas’ fifth all-time appearance in the NCAA Tournament, all under Hale. In its history, the Razorbacks are 4-2-2 in NCAA Tournament games and has made it to the second round four out of five times. Including SEC Tournament games, Arkansas is 11-6-5 in postseason matches under Hale. Little Rock enters the NCAA Tournament at 14-4-3 on the year and won the Sun Belt Tournament championship last week after defeating regular-season champion Texas State in penalty kicks. This will be the first appearance in program history for the Trojans and the Sun Belt title was their first conference championship.